Long time lurker, gamer, and hobbyist. I've been collecting chaos marines since the early 90's and never really been good playing, or modeling them until recently. This is my third go around at a Night Lords army and i think i finally have the recipe for success. Disclaimer : My fluff might contradict what you envision these legions to be and how they fight or operate. Let's not get too caught up in the interpretation of these legions. These are my proxied Khorne Bezerkers. Before making them my army was a mess of whatever cool weapons i could get a hold of. 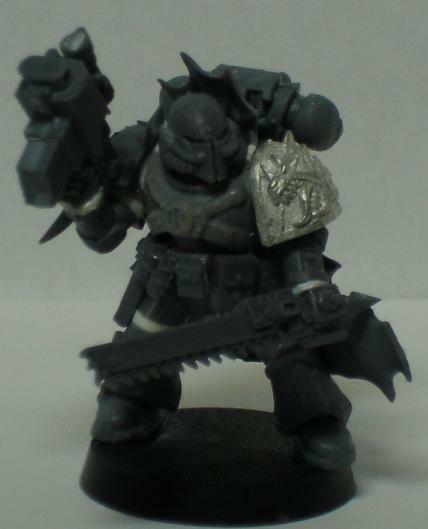 My old "counts as" bezerker squad had about six power weapons modeled into the squad, they looked a mess. A buddy of mine beginning his Word Bearers Army made them a strict, regimented (Yet Chaotical) force which i always admired. 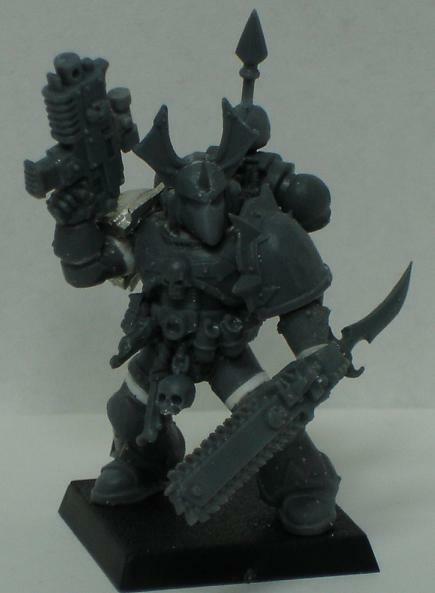 While my Marines were a mess of poses and war gear, his were strict, disciplined and well thought out. I was jealous so i began work on these guys trying to encompass the best of both worlds. I spaced their waists out with a small rod of plasticard (ripped from the WB'ers) and their necks with a small rod as well. At first glance it is not too noticeable but standing next to normal marines it removes the encumbered power armor look. To hide the gaps between his torso and legs i had to begin strapping on as many pouches as war gear as i could. The one thing my supposedly nasty, terrifying troops were missing were death totems and marks. Playing Night lords is all about atmosphere for me. My guys don't like fair fights, in fact they don't prefer fighting at all, just mercilessly killing and torturing civilians and leaving just in time before someone retaliates. I needed grisly, death inspiring guys, which led me to creating this squad. These guys i went all out on. It took me most of one day to create one of these marines. I spaced their legs, their waists, their torsos, shoulders, arms, wrists, necks, and backpack mounts. They were all created with fear in mind and strictly adhered to WYSIWYG. There is one melta gun, one flamer, one champ with a HUGE power weapon, and the icon bearer, which uses IoCG exclusively. I used bits from countless armies across 40k and fantasy. The most predominant are dark elves, vampire counts, and the space marine, chaos range. There are bits from lizardmen, imperial guard, Orks, Deamons, and empire kits as well. A break from the Night Lords for a moment. On a late boring night I felt the need to make an Alpha legion trooper. The chosen theme was not death or destruction but more along the tactical superiority of lone alpha legion troopers. I was so happy with the initial result i felt the need to make a whole squad of them! I modeled them with tricked out bolters and plenty of ammo, scopes, and communications gear. I decided to play them using Noise Marine rules. A skirmishing force capable of tactically running from you all game and still shooting 24! Guilliman may have taught you to shoot once at range, or move and spray. Alpharius taught us to think outside the box! One of the biggest elements in both of these legions is scouting, stealth, and infiltration. Chosen are nice and all, but unnecessary. I decided to create weapon teams operating behind enemy lines using Obliterator rules. Deep Striking would be throwing off cammo cloaks or coming out of a hide site and then sowing dissaray into my opponents. Here is my interpenetration of these teams. I modeled these guys for fun and to add depth to my army. They've been treating me well in the fight too! The paint scheme i am thinking of is pretty neutral. I'm not the greatest painter and when i pick up the brush it takes me days to complete one model. I'm terrified of starting these guys until i have got it down but i am aiming for something similar to an old champ of mine. When making him i was aiming for spectral/non dimensional wings. As if he is blessed by the gods and is on the way to becoming something infinitely more powerful. My main inspiration for him was from the book Storm of Iron where the warsmith is attaining his daemonic nature. 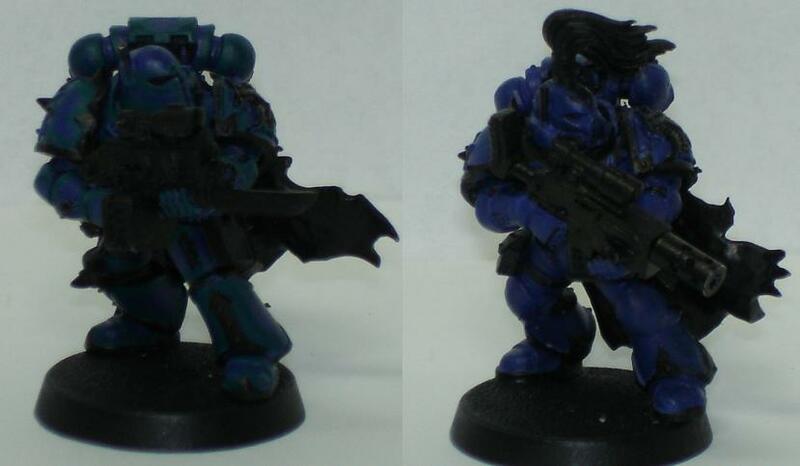 Here is a size comparison to an unaltered marine. 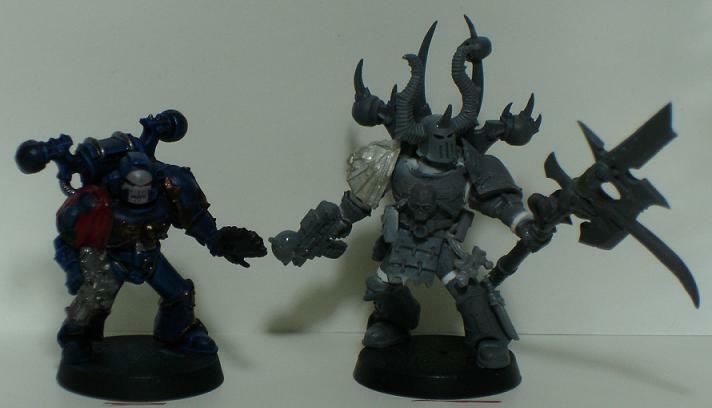 Future projects are updating the Alpha Legion to the spaced out armor, another squad of Chaos glory Night Lords, and maybe redoing my Bezerker squad and using the old bland ones as initiates or something. C + C greatly appreciated! Edited by Dan The Deamon, 08 July 2016 - 06:05 AM. i am particularly fond of the oblit "weapon teams". they look great and they are a perfect fit for this army. Those are some Schweet looking Chaos Marines! I absolutely love the Weapons Team idea for the Oblits! I can't wait to see them painted. Welcome to the B&C! 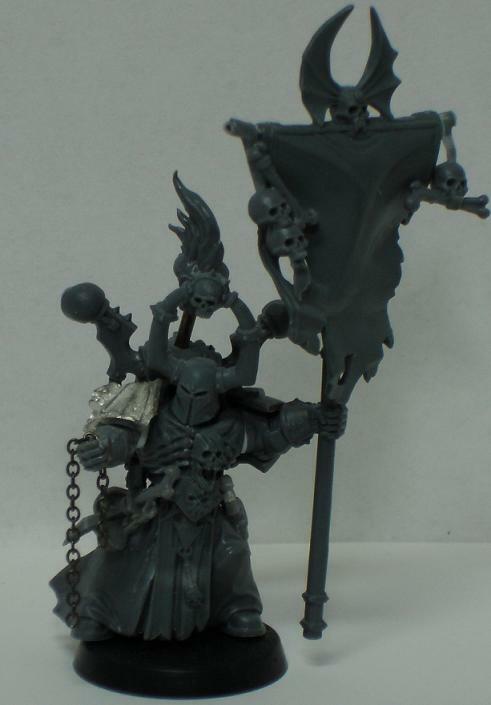 These look great so far - lots of cool, subtle, effective conversions. Looking forward to seeing this army develop! The pictures i gave don't show detail that well so i got some better close ups of my favorites. I love these models. Absolutely love them. 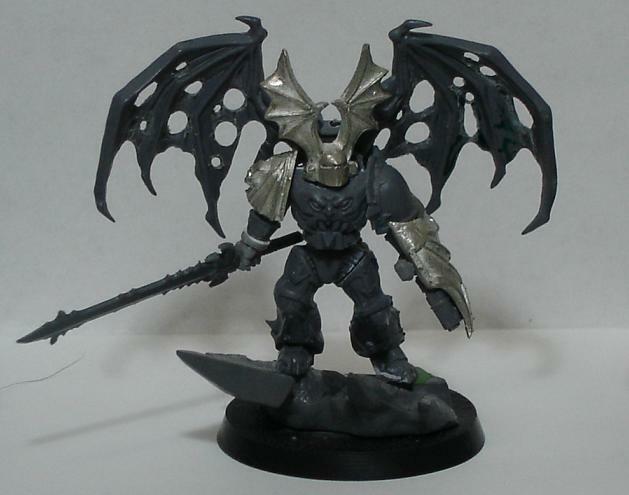 I think the way you have handled the bat wings on the night lord helmets is particularly excellent. In the beginning the universe was created. This made a lot of people very angry and has been generally regarded as a bad idea. I am going to have to keep an eye on this one. The darks greatest gift is the light itself: as days are defined by the nights that divide them, as stars are defined by the infinite dark through which they wheel, the dark embraces the light, and brings forth from the center of itself. With each victory of the light, it is the dark that wins. It's not often that I comment on the PCA boards outside of my own topics, but the quality and character of this army is insane! The fact that I want to watch this thread closely enough to add it to my subscribed topics says something to me. I'm looking forward to your continued progress. 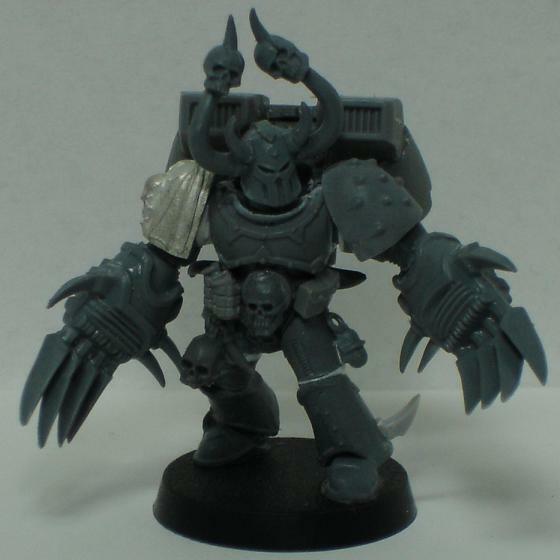 I especially like the Counts-As Obliterators, very nice. You make me want to throw off my Imperial shackles and follow the Dark Gods. My hat is off to you, sir.
.:.It's not the Great who are strong, It's the Strong who are great.:. These are excellent. I wish i had thought of the oblit weapon teams. Your upscaling is also very nice without needing to go as far as full truescaling. I agree, this is A+ work. - Flawless Host army project. I notice all your berserkers have the same helmet and backpack. Where did you get that many? That's some serious bitz you've got going. I remember how you started struggling with the Oblit teams. Just goes to show how the original image in your mind can shift and change as you go along, and the end result might look a little different than you originally thought, but after spending that kind of quality time on them, you probably don't even remember the exact details of the original concept. once again - GREAT JOB! awesome how they just about all have some sort of skull or screaming face on their chest. LOVE the dude on the square base. and as always you know we see eye-to-eye on the fluff. oh yeah, thanks for the props too. You had me at "weapons teams". 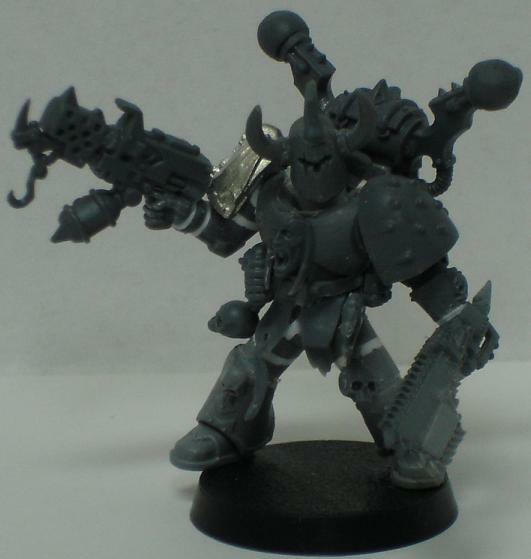 I hate Obliterator models and the entry in general, but your idea has brought a great amount of respect from me. I might even try this with my Death Guard at some point! Please keep us updated!! I love this army! I will HAVE TO incorperate some of the ideas from this army into my own Chaos army, based around Dragons. 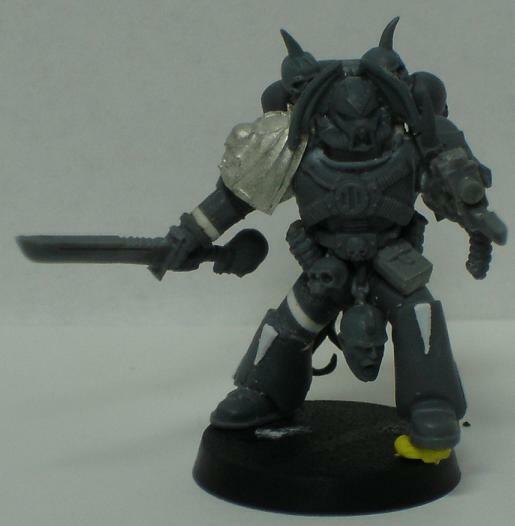 1: how did you get the corsairs' cloaks to fit on the Marines? 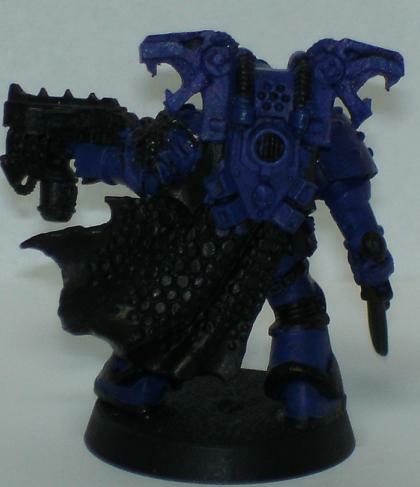 2: Where'd you get that Dragon-Headded backpack for the Alpha legion Sergeant? Does anyone else think that Kor Phaeron looks like Prince Phillip? Beautiful kitbashes here mate! Troops, Havocs, and all inbetween... I honestly can't choose a favorite. 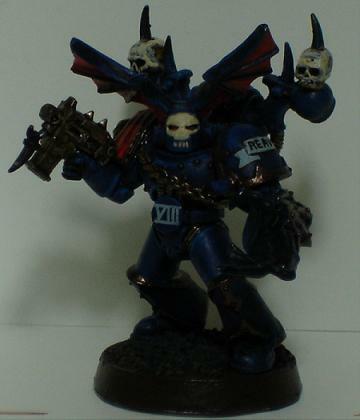 Excelent use of Posessed wings on the leader, really brings out the Night Lords feel. Keep up the awesome work! wow...i mean...Chaos space marines that look chaotic. and not in a overdone way to make them too over the top. These are really great and well executed, as everyone else had said, great heavy weapon team idea. 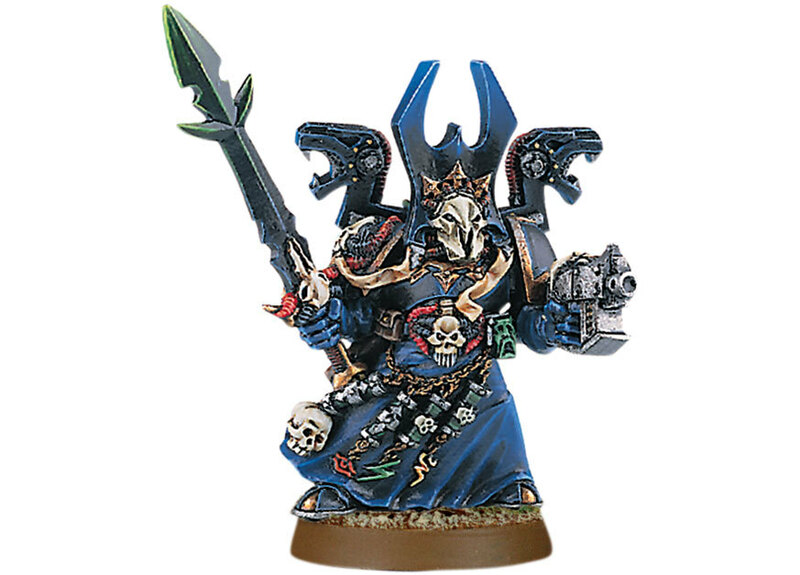 The lightning claw marine reminds me of those people who fart in a lift, and when peoples stare his way he sorta shrugs his shoulders and is like "it wasn't me!" Down with Bolter and Chainsword, up with the-waaagh! Thanks for all the kind words and replies! Those of who who are wondering where my bits are coming from, I've been collecting chaos marines off and on since '96. I have something around 15 or 16 thousand points of assembled models. None of them are kitbashed quite like these. i've thrown them all in boxes and storage and decided to concentrate just on one army. The culmination of my collection, and the guys at battlewagon bitz, have built this army out of spare parts. The backpack that you are referring to i built out of an old chaos sorcorer backpack and a new chaos version. Here are some pictures. The backpack is metal and regretfully GW doesn't sell the bit separate anymore. They still sell the model for approximately $13 though. Here's a new Alpha legion Marine i built while making the tutorial for the cloaks. It's almost done, I haven't forgotten about you guys! By the way, i realize i haven't drilled any bolters. I plan on doing the whole army at once and don't want to be inconsistent by doing them separately. really like the corsair cloak. Those are awesome. Great conversion work my friend. Chaos has some neat bits to use for certain. 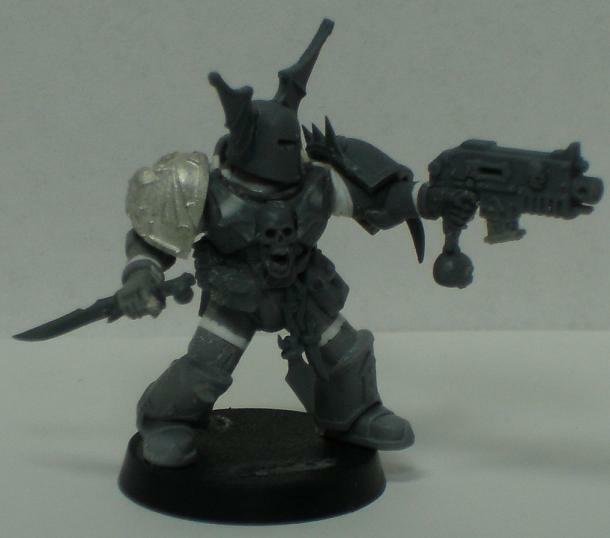 I use the same chaos champion head for my Death Company. Really really good work man. Check out my Ebay auctions. I am Kaptainfun there. For everyone interested i have posted a cloak tutorial in the Tutorial Section.